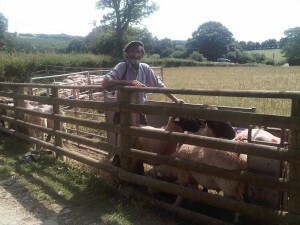 These pictures are of Gordon our sheep grazier at Holt Farm. All the buildings at Holt Farm are now holiday cottages so Gordon has set up some temporary pens for his flock and is working in the midday sun to care for their health. Sheep have to be inspected and moved regularly around the fields to give them fresh grass. Shepherding is a young mans game for those who are agile and fit. Our grazier Gordon is over 70 but recently did a full days shearing just to show the younger lads that he still has the necessary skills and stamina!